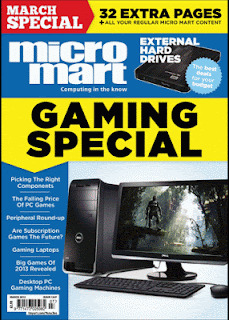 Then why not buy the Micro Mart magazine this week and read the March issue of my monthly series covering Raspberry Pi news, community events, hardware, software, games and tips. Limor Fried, or Ladyada as she's known on the web, is the CEO of New York-based AdaFruit Industries. AdaFruit provide electronic components, project kits, and masses of helpful device-hacking open-source designs, construction tutorials and general tips. High on the AdaFruit kit popularity front is the MintyBoost. It's a portable USB charging device, built from a few electronics components housed inside an Altoids tin - perfect for delivering an emergency power boost to your mobile phone. The Model A board has been available from the Premier Farnell/element14 and RS Components for a number of weeks now. This slightly stripped-down version of the Model B is likely to be a big seller. After all, a $25 Linux-based computer, perfectly suited to software coding, gaming and project construction, has to be the bargain of the decade. If you're just beginning to create electronic circuit layouts you might like to mockup and evaluate your designs first. If so, hop over to CircuitLab's website to create a virtual circuit board layout and simulate its behaviour. The website also includes a list of quick-start circuits to browse and edit. I mentioned Mojang's Minecraft: Pi Edition - the special, hackable version of Minecraft for the Raspberry Pi - in my January potpourri. Now Mojang have replaced the previous beta version with a full version of the game.